Introduction: Intracranial complications of the sinusitis are the extension of the infectious process for adjacent structures, happening in a small, but significant number of patients. Among the one of nasossinusal origin the subdural empyema represents one of the most commonly found, presenting significant morbity and mortality. Aim: It was reported a patient's case with subdural empiema due to sinusitis, that developed favorably with the treatment. Case Report: A thirteen year's old, male, white, with front migraine of strong intensity, continuous, developing with neck rigidity, and tonicclonic seizures. Treatment began with antibiotic of wide spectrum, corticosteroid and anticonvulsant therapy. It was associated surgical treatment with endoscopic sinusectomy and drainage of the frontal empyema by craniotomy. Conclusions: The subdural empyema as an intracranial complication due to the sinusitis presents morbity and considerable mortality, should be faced as urgency and treated with aggressive and multidisciplinary terapy. They are more common in male young patients, presenting unspecific symptoms. The tomography stays as first complementary exam for its diagnosis. The treatment is based on antibiotic therapy of wide spectrum, associate to the otorhinolaryngological and neurological surgical approach. Intracranial complications (ICC) of the sinusitis are the extension of the infectious process for adjacent structures, affecting a small, but significant number of patients. The most commonly found origins are the subdural empyema, brain abscess, meningitis and extradural abscess(1). Empyemas can develop as either a simple headache or even as hemiparesis, convulsions and conscience alterations. The diagnosis of such disease is based on clinical conditions, combined with imaging exams. CT (computed tomography) is considered the first exam for those patients. However, magnetic resonance imaging (MR) still remains the golden standard to diagnosing any type of ICC(2). Its therapy is based on wide-spectrum antibiotics combined with both ENT and neurological surgery most of the time. 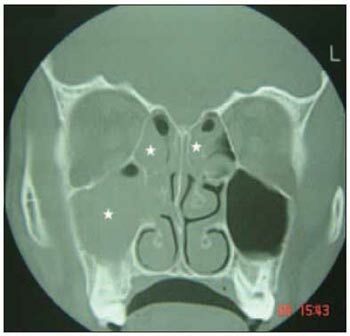 The target of this study is to report a case of a patient with subdural empyema from rhinosinusitis that develop favorably with clinical and surgical therapy. A 13-year-old male, Caucasian patient, previously sane, with a 40-day-history of continuous intense right frontal headache combined with fever and sickness. At first exams, he presented regular health condition, feverish and nape rigidity, developing general tonicclonic seizures. He started treatment by wide-spectrum antibiotics (ceftriaxone, vancomycin, methronidazol), corticotherapy (dexamethasone) and anticonvulsivant (phenytoin). ENT evaluation showed bilateral purulent secretion at anterior rhinoscopy, post-nasal drainage oroscopy, with otoscopy and normal response of the cranial nerves. Cranial, nasal cavity and paranasal sinus CT showed right and interhemispheric subdural empyema, inflammation signs on frontal lobe and veiling of right, bilateral ethmoidal and sphenoidal maxillary sinus (Pictures 1,2,3). It was chosen to proceed antrostomy, ethmoidectomy, sphenoidectomy and frontal sinus drainage of the affected side via endoscopy by using optical lenses (0º, 30º and 45º), combined with empyema drainage by frontal cephalotomy. During procedure, intense oedema of nasal mucosa and obstruction of the bilateral ostiomeatal complexes with drainage of purulent secretion after their opening were observed. Material was gathered for aerobic and anaerobic bacteria and fungus culture. There was no microorganism growth after that. There were no occurrences after surgery and patient developed well and was completely healed with no sequela. Initial medication was carried out for five weeks. Subdural empyemas, caused by sinus disease, are rare but still occurring. They specially affect males under 20 (3;4). This might happen due to the maximum increase of the diploic system vascularization and to the frontal system development which occur between the ages of 7 and 20(5). 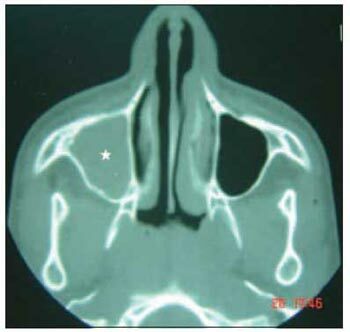 The intracranium occurrence caused by rhinosinusitis can happen via blood, via retrograde thrombophlebitis of veins that connect facial and cranium sinuses, or even via contiguous process due to traumatic or congenital rupture of an organ, sinus wall erosion and existing foramen(4;5). A large amount of microorganisms have been described as etiological agents of such implication. Among these microorganisms, we can notice a predominance of the Staphylococcus aureus, Streptococcus sp., Haemophylos influenzae and others such as gram-negative and anaerobic bacteria. Cultures can be sterile up to 50%, perhaps due to the fact that patients might have already been under antibiotics therapy before collection(1;4;6). Secretion culture of the current study did not present growth on any of the microorganisms. The most commonly existing signs and symptoms are headaches, fever, sickness, conscience alterations, hemiparesis and convulsions(1;3). One might be aware that patients can badly develop with constant headache and fever even under initial therapy. They might even present neurological manifestations(4). Subdural Empyema diagnosis, as well as other ICC, is based on clinical suspicion and judgement. CT is chosen for diagnosing when subdural empyema is suspected or when surgery is considered. Nevertheless it can present a false negative result. If clinical suspicion remains, CT can be repeated after 24 hours, or else, MRI can be performed(2). The contrasted tomography exam was performed for the current case, and it confirmed the diagnosis and also provided essential data for surgical procedures. Subdural therapy caused by rhinosinusitis is initially based on wide-spectrum antibiotics combined with third-generation cephalosporin, methronidazol and vancomycin, and they are revised after culture results obtained during surgery procedure, and are usually conserved between four and eight weeks due to antibiotics penetration reduction into the central nervous system during therapy(1;4;6). In the current study, antibiotic therapy was started early and was performed for five weeks after surgery. Surgical therapy consists of neurological approach. Cephalotomy with drainage of intracranial collection combined with endoscopic surgery of the paranasal sinuses have been performed and presenting good outcomes(5). In the current case, the procedures were antrostomy associated with ethmoidectomy and bilateral sphenoidectomy and frontal sinus drainage. From those, it was obtained, with good results, accumulated secretion drainage and sufficient ventilation from the nasal cavity and affected paranasal sinuses. Frontal cephalotomy was performed, during the same procedure, by the same neurosurgery team, presenting positive results afterwards. Subdural Empyema is a type of intracranial implication from rhinosinusitis, it is uncommon but presents a high rate of mortality, and then it should be faced as an emergency situation. Under clinical suspicion, CT is considered as a first complementary exam on diagnosis investigation; however it can fail on the initial phase. So, MRI is the standard exam for diagnosing any of the ICC types. This latter one should be performed when doubts persist. Therapy is based on wide-spectrum antibiotic therapy for a long period and should be combined with ENT and neurological surgical approach and good prognosis. 1. Jones NS, Walter JL, Bassi S, Jones T, Punt J. The intracranial complications of rhinosinusitis: Can they be prevented? Laryngoscope 2002; 112:59-63. 2. Younis RT, Anand V, Davidson B. The role of computed tomography and magnetic resonanse imaging in patients with sinusitis with complications. Laryngoscope 2002; 112: 224-9. 3. Góis CRT, Pereira CU, DÁvila JS, Melo VA. Complicações Intracranianas das Rinossinusites. @rquivos 2005; 9:335-43. 4. Penido NO, Borin A, Pedroso JS, Pessuto JMS. Complicações Intracranianas Sinusais. Rev. Bras. Otorrinol. 2001; 67: 36-41. 5. Fountas KN, Duwayri Y, Kapsalaki E, Dimopoulos VG, Johnston KW, Peppard SB, Robinson JS . 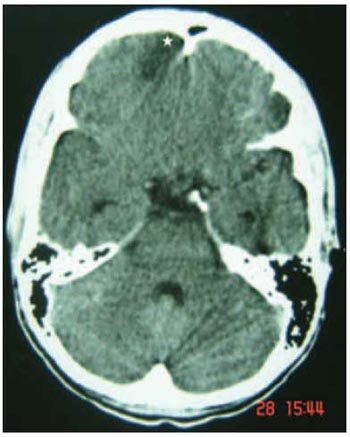 Epidural Intracranial Abscess. Southern Medical J 2004; 97: 278-83. 6. Penido NO, Borin A, Fukuda Y. Necessidade de avaliação e conduta otorrinolaringológica nos pacientes portadores de abscessos e empiemas encefálicos. Rev Bras Otorrinol 2001; 68:794-99. 1. Physician. Resident Doctor in the ENT Service at HSPM - São Paulo. 2. Medical (a) Assistant to the Department of Otorhinolaryngology, HSPM of Sao Paulo. 3. PhD in Science by post-graduation program of Otorhinoloryngology and Head and Neck Surgery by USP-São Paulo. Assistant doctor in the ENT Service at HSPM - São Paulo and Derdic/PUC-SP. Serviço de Otorrinolaringologia do Hospital do Servidor Público Municipal (HSPM) de São Paulo. Address: Rua Tamandaré, 734, ap 133, Bairro Liberdade. CEP 01525-000. São Paulo/SP. This article was submitted to SGP (Publication Management system) of R@IO on January 17th, 2007 and approved on October 10th, 2007 at 10:55:47.